A disciplined display earned Cumbernauld Colts safe passage in their William Hill Scottish Cup tie at Burntisland Shipyard on Saturday. Goals from Fraser Team, Stephen O’Neill and Sean Brown, with a double, saw off the East of Scotland League side and secured Colts a second round tie at home to Lowland League rivals BSC Glasgow. Colts started on the front foot and in seven minutes only a superb save from home keeper Ryan Adamson prevented Craig Holmes from opening the score with a powerful drive. The normally reliable Brown missed a couple of chances, but the opener came in 12 minutes when O’Neill delivered a great corner into the danger area and Team superbly glanced a header beyond Adamson from 10 yards. Colts continued to dominate. A thumping O’Neill volley was brilliantly pushed onto the bar by Adamson and Brown, Arnault Bembo and Team all came close. But the hosts hit back on the stroke of half-time when a great through ball by Jonathan Galloway allowed Reece Brown to run in on goal and lash a shot high past Jordan Pettigrew. The equaliser stunned Colts, who had been well on top, and Burntisland started the second half strongly. 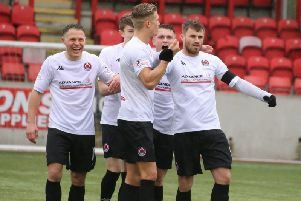 A Jordan Galloway volley flashed across the face of goal and a minute later Callum McAulay headed over from point blank range when he should have scored. But Colts began to find their rhythm again and edged back in front on 61 minutes when great work on the right by Holmes was finished off by Brown who flicked a low cross past Adamson at the near post. Only a tremendous save from Pettigrew denied Robbie Crawford from levelling the game again, before Colts extended their lead in 77 minutes. Substitute Jordan Marshall played a long raking pass to find Team who drew Adamson off his line and lobbed the advancing keeper, allowing Brown to run on and knock the loose ball into the empty net. Colts secured the victory in 87 minutes when Richie Kirwan cut back for O’Neill to drill low past Adamson.